UTC basketball coach Matt McCall directs players during the Mocs' basketball game against the ETSU Buccaneers at McKenzie Arena on Saturday, Feb. 18, 2017, in Chattanooga, Tenn. UTC fell to 10-5 in the SoCon following their 65-51 loss to ETSU. After a couple of days of being wined and dined, Matt McCall was pretty sure he wanted to accept an offer to become the men's basketball coach at the University of Massachusetts, but he needed final clearance from his wife, Allison. Once she arrived in Amherst and liked what she saw, McCall knew he had found a new spot. 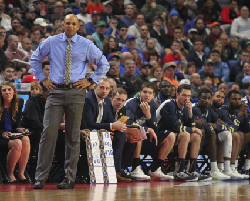 The former University of Tennessee at Chattanooga coach became the Minutemen's leader Wednesday after two seasons in charge of the Mocs. In his time at UTC, McCall's teams compiled 48 wins and won both the Southern Conference regular-season and tournament championships in 2016. That season boasted a school-record 29 wins, including victories over Georgia, Dayton and Illinois. 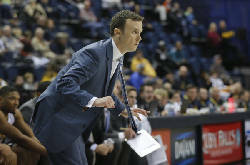 His second season started off strong with a victory at Tennessee, and the Mocs were 9-3 in the nonconference slate and 15-4 early in the conference season, but they sputtered down the stretch with losses in eight of their final 12 games, ending in a quarterfinal exit at the SoCon tournament. That ended UTC's bid for back-to-back NCAA tournament appearances for the first time since the mid-1990s. McCall was in Florida recruiting Monday morning when he got the call from UMass to gauge his interest. "It happened really, really fast," McCall said by phone Wednesday evening. "That's what happens in this business. "I would have never left Chattanooga for just anything, but when I got here, I could see that they want things to be how it was when John Calipari was here, when Marcus Camby was here." McCall's contract is reportedly for five years and $750,000 per year with bonuses. He was making $232,000 per year at UTC. It also helps that McCall's wife is now 2 1/2 hours away from her hometown of Long Island, N.Y. With two small children — 3-year old Brooklyn and 18-month old Kylie — she now has more readily available help when her husband is coaching or on the road recruiting. UMass, which has eight NCAA tournament appearances in its history (most recently in 2014), went 15-18 overall and 4-14 in the Atlantic 10 Conference this season, Derek Kellogg's ninth as coach. He was fired early this month, having gone 155-137 with the Minutemen. Because of how quickly things transpired, McCall had to inform UTC players he was moving on via Skype. That talk was described as "emotional" by McCall and athletic director David Blackburn. "I didn't want to do it this way, but I didn't have a choice," McCall said. "I've invested a lot in these recruits, and David Blackburn has invested a lot in me. I'm always going to be indebted to those in Chattanooga." The Mocs will lose five seniors from last season's 19-win team. They'll return 23 percent of the team's scoring and 38 percent of its rebounding — far cries from the 77 and 78 percent McCall inherited when he came on board after formerly assisting Billy Donovan at Florida. Junior forwards Nat Dixon and Makinde London and sophomore guard Rodney Chatman will be UTC's most experienced returning players. Sophomore guard Makale Foreman earned some time in the rotation late in the season. There is expected to be only one senior on next season's roster — forward Trayvond Massenburg, a late recruiting addition from the junior-college ranks. Blackburn said the search is already underway for McCall's replacement, and he expects it to go quickly. 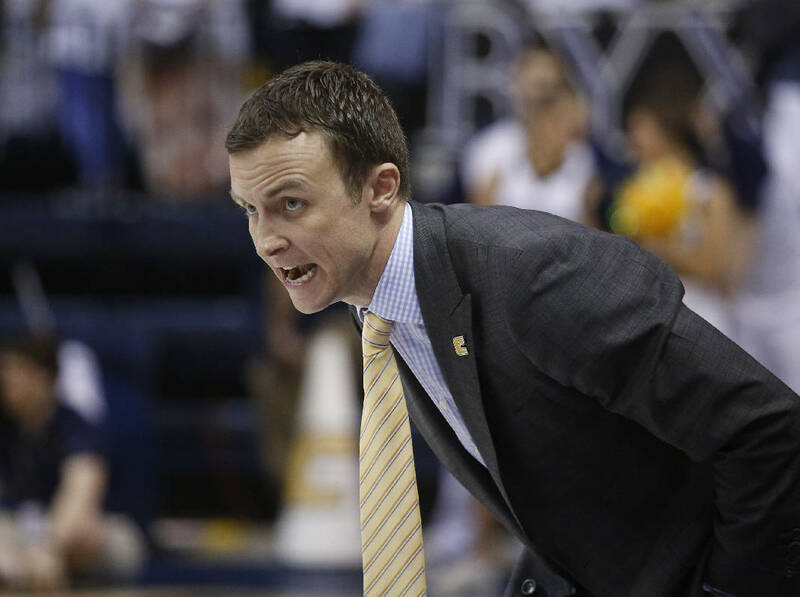 It will be his third men's basketball head coaching hire since taking over in 2013, with McCall predecessor Will Wade also staying two seasons before leaving for Virginia Commonwealth University. "First of all, I want to say thank you to Matt McCall and congratulate him on this next step in his career," Blackburn said in a news release. "We are grateful for the work he and his staff did to continue the re-emergence of this program started by Will Wade four years ago. "More importantly, we are appreciative of our student-athletes. The work these young men did to elevate the Chattanooga Mocs' brand as a nationally recognized program was extraordinary. Their efforts make this an extremely attractive place for coaches throughout the country along with the outstanding support of our athletics staff, campus administration, students, alumni, fans and the city of Chattanooga. "We have begun a national search to find the right person to lead us to even greater heights. We are excited to continue getting better and better in the years to come."